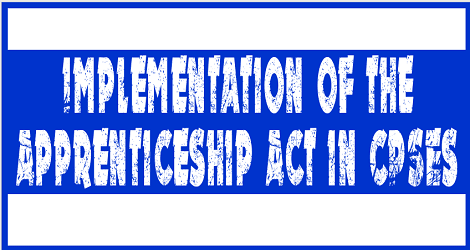 Subject: Implementation of the Apprenticeship Act in CPSEs - regarding. (i) Establishments have been allowed to engage apprentices within a band of 2.5% to 10% of the total strength of employees. (ii) Establishments have been allowed to conduct apprenticeship training in optional trades also in addition to designated trades. (iii) Scope has been extended also to non-engineering occupations. (iv) Restriction on the inspection by officers. (v) Aggregation of apprentices and establishments especially MSMEs through Third Party Agency. Submission of apprenticeship contract through portal and its time bound approval. 2. Further, Ministry of Skill Development & Entrepreneurship has notified an ambitious new scheme titled “National Apprenticeship Promotion Scheme" (NAPS) on 19th August. 2016 to promote apprenticeship training. The scheme provides for reimbursement of 25% of the stipend payable to apprentices directly to employees. The scheme also envisages sharing of the cost of basic training with “Basic Training Providers (BTPS)” in respect of apprentices who come directly to undertake apprenticeship training without any formal training. The guidelines of NAPS are available at www.apprenticeship.gov.in. (iii) Avail the benefits of NAPS. 4. In view of above, all the Ministries/Departments concerned with CPSEs are requested to issue suitable instructions to CPSEs under their administrative control to comply with the provisions of the said Act and rules frames in this regards along with specific points emphasized at Para 3 above.